The STAR recently covered a story on KL taxi drivers. I am sure you've heard the horror stories surrounding KL taxi drivers, who had earned the city the reputation of having the worst taxi drivers in the world, according to LondonCabs.co.uk. Other views by the popular travel website Tripadvisor, has also warned travellers about KL's errant taxi drivers who "refuse to use the meter, quoting a fare often with the view of ripping you off". "This quoted fare is generally akin to daylight robbery, and sometimes when haggling takes place, it is reciprocated with rude gestures or abusive language." adds Tripadvisor and on Virtualtourist.com, a visitor posted: "I have travelled the world and from Bombay to Boston I can tell you the taxi drivers in KL are the biggest pack of thieving lying dirt bags you will ever come across." In fact these findings are not new or discovered this year. In fact, in year 2008, The Expat magazine had ranked Malaysia's taxi drivers as the worst in the world based on survey conducted among 200 respondents from 30 countries. Not a pleasant reading, is it? But do we really know whether there is truth to such claims? If some bad apples caused these, why are they behaving in such a way? Hence our project. Our project is called "TEKSI"
As the saying goes, "there are two sides to every coin" and hence, we'd like to cover the different stories told to you from 3 different backgrounds on their lives as taxi drivers. The end product would be ten (10) episodes of short-films of ten (10) minutes each that will culminate into one (1) whole film known as "TEKSI". As a new stakeholder in the taxi industry in Malaysia by virtue of being a technology service provider for taxi drivers, TaxiMonger feels that it is dutiful to defend and protect the rights of the taxi drivers. 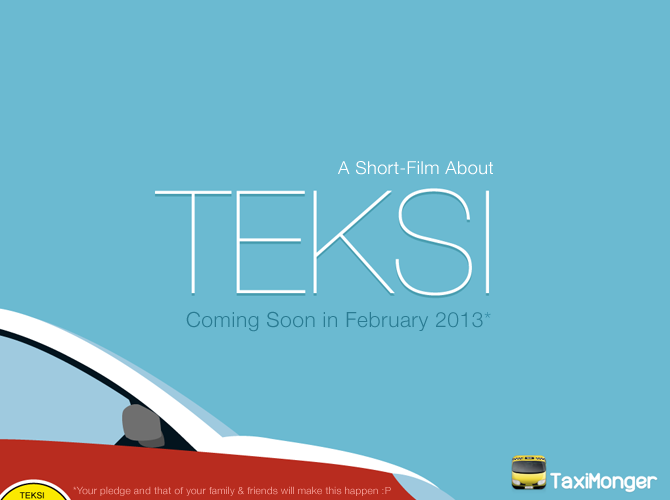 Hence, "TEKSI" will be a no-holds-barred film that will not align its interest to any parties but will represent the voice of taxi drivers, hence "TEKSI". WHAT IS THE FILM ABOUT AND WHY WOULD YOU WANT TO SUPPORT IT? The objective of the short-film is to portray the actual lives of the majority of taxi drivers who ply passengers from morning until night daily to make an honest living. In this light, we hope the general public would be able to have a balanced view against the negative connotations of taxi drivers in Malaysia that are caused by a few bad apples. In the short-film, we shall illustrate the contributing factors that lead to the trials and tribulations of many taxi drivers. We shall illustrate the contributing factors that lead to the challenges and obstacles faced by taxi drivers including but not limited to economic conditions and unfair trade practices such as coupon system and concessions by building owners. In short, we want the general public to know that there are more honest taxi drivers than the bad ones. Also, we want the public to know why some of the errant taxi drivers are behaving the way they do. We also welcome pledges from overseas namely among expatriates and tourists who have had bad encounters with Malaysia's taxi drivers so that we can tell them our story, the story by taxi drivers themselves. We need USD20,000 to produce the short-film entitled "TEKSI", which we plan to broadcast syndicate it to major TV networks in the country and also the region. We shall also broadcast via YouTube, which could help the video to grow viral. We hope that with your support, we can bring you that story that you may have not heard off. A DVD copy of the short-film in hardcover inclusive of postage delivery. A DVD copy of the short-film in hardcover inclusive of postage delivery and a free taxi-ride to the airport whether LCCT or KLIA for your next taxi ride. Credentials as "Producer" of the short-film, opportunity to act in the short-film for a supporting role, invitation to attend the exclusive screening of the short-film and a DVD copy of the short-film in hardcover inclusive of postage delivery. Placement of product brochures in up to 800 taxis within pre-defined brochure size and allowable quantity per taxi and a DVD copy of the short-film in hardcover inclusive of postage delivery. Product placement exposure for 45 seconds and logo display for 15 seconds in one (1) episode ONLY and a DVD copy of the short-film in hardcover inclusive of postage delivery. Brand logo in each of the 10 episodes during the Pre-Roll (for 10 seconds) and Post-Roll (for 10 seconds) and a DVD copy of the short-film in hardcover inclusive of postage delivery.